If your answer is YES then I have good news for you. The good news is that I was not born with the ability to make money online, I learnt it myself and if I can learn it, then you can also learn it and make money online. My desire to help and assist many Nigerians like you that are passionate in making money online made me to spend restless days and sleepless nights in order to create a very detailed and powerful way to show you how you can equally start your own money making online information marketing. And the result of my sleepless nights and restless days brought about what I want to give you right now. I just created a very Simple And Easy To Understand ebook where I explained everything about online information marketing and how you can also start within 24 hours and start making money immediately, no long story like paypal and other time wasting requirements. 1. What online information marketing is all about. 2. How to start making between N4,000 to N7,000 every day through online information marketing. 3. How to set up this online system within 24 hours and start making money immediately. 4. How to use your facebook account to double your daily income thereby making between N8,000 to N14,000 every day. tell someone his source of income and tricks in making it but i say to you, even giving you this trick and method also improve my knowledge and experience towards gaining more through your questions and able me to search for things to impact to you for a good financial status. If you truly want to make REAL MONEY online then THIS EBOOK IS ALL YOU NEED to succeed in internet business, forget about what other fake gurus told you about online business in Nigeria, learn from someone that is successful and you will also be successful. I will give you my 100% support on these online businesses through phone calls and emails until you start making money, I will also add you to my secret facebook group where you will have the privilege of meeting other highly successful internet marketers, in this facebook group you will have a 24/7 support and assistance from me and other members, being a member of this facebook group is worth N10,000 but I will add you to this group FREE. I compiled two e-books (Internet Business Manual And Importation Business Manual) together as a single e-book for you to easily access them and read them conveniently. The title of this Two In One e-book is “Two Income Manual“ Combining the online Information Marketing and this Importation Business, you will be able to make over N250,000 every month without sweating it out, you can do everything right from the comfort of your room. Enough Mr. Adewole, I am Interested In This Two Income Manual, How Much Can I Pay For It? Considering how POWERFUL this Two Income Manual is, I can easily sell it for N30,000 and it will still be considered very cheap when you compare it to the weight of the benefits you will get in this e-book. Let’s be honest with each other right now. Do you know of any business or income plan that you can invest N30,000 into and be able to make up to N250,000 in the first month? I doubt there is, so even if I charge N30,000 for this e-book, it is worth the price. But the truth is that some people’s monthly salary is not even up to N30,000 and I am committed to helping as many people as I can help. I am sure N1,500 is less than what you spend on phone recharge credits in a week. 1. Invest N1,500 into yourself and use the secrets you learn from it to build an income system that can make up to N250,000 or more monthly for YOU! Or..
2. You can spend the N1,500 on phone recharge cards or junk food from Mr. Biggs and gain some weight while knowing deep down in your heart that you are growing older and you are not taking advantage of life-changing opportunities like this one. The decision is yours, But if I was in your shoes, I know which option to take. In fact, I was actually once in your shoes. Out of every 100 people who arrive on this page, about 10 of them will take up this chance to change their lives. You should be a part of this 10. Those are the excuses that unserious people will always give whenever they don’t want to take responsibility .Don’t be a part of these people. Before I forget, I intend to increase the price of the e-book back to N5,000 by 12:00 A.M This Night so you need to take action very fast while the price is still N1,500. If you come back here Tomorrow 2018 , you Will Have To Pay N5,000 to get this e-book You Never can tell. and I will refund your money with a deep and sincere apology for wasting your time. Your investment is safe and secured, you have nothing to lose. Now This Is How To Make Payment For This eBook And Take Advantage Of This One Time Offer Before The Price Rises To N5,000. Once you send these details, I will send you the eBook to download Immediately I confirm your payment. The eBook will be sent to your email or whatsapp number within 2 hours or less. Note: You can download the eBook with your smart phone (Android, Blackberry, I pad, I phone etc ) or laptop then you can read anytime and anywhere .Don’t Miss This Opportunity Because You Will Never See It Again. Will You Allow Just N1,500 Stop You From Taking An Action That Will Change Your Life For Good?. It has been discovered that the major reason why a lot of people are still poor is the Fear Of Failure, do not allow fear to stop you from taking a step towards success, poor people keep saying “what if I try and it does not work? but the question should be “what if you try and it works? Not taking a risk in life is a risk itself. N150,000 to your monthly income, that is more than what most bankers make. 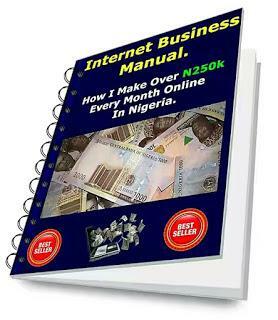 I just created a Step By Step eBook that will guide you on how YOU CAN start making over N250,000 every month through online businesses, the eBook will reveal to you how you can start online information marketing within 24 hours and start making money immediately, it will also guide you on how you can start a very profitable importation business that can earn you an extra N150k profit every month. When you order for this eBook, I will send it to your email within 2 hours. The price of this Two Income Manual is just N1,500 only for today. P.S: If you are seeing a price of N1,500 that means you are very lucky, I am telling you that if you come back here tomorrow the price might be N5,000 You never can’t tell. I Look Forward To See You Making The Right Choice. Call/SMS From 8:00 AM to 9:00 PM.